Today marks the halfway point of our tenth annual Young Authors’ Workshop! 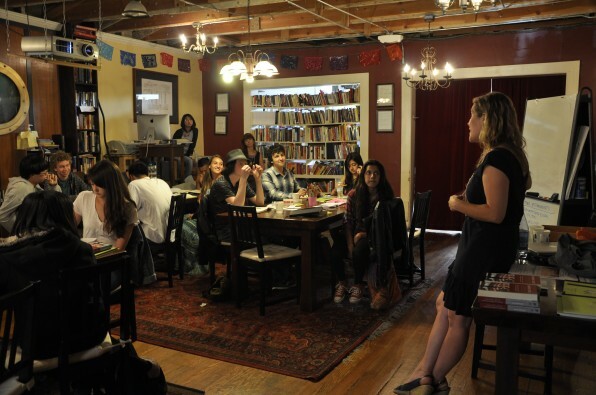 This week-long intensive writing camp offers high school students in the Bay Area the chance to develop their writing skills and explore different genres with professional authors, poets, and spoken word artists. So far, the workshop has been a huge success: on Monday, students learned about building characters with Dave Eggers and first lines, first paragraphs and first chapters with Erica Lorraine Scheidt. Yesterday, talented musician Thao Nguyen led a workshop about creating empathy in stories and lyrics. Cliff Mayotte from Voice of Witness taught students about the art of writing oral histories and Vendela Vida shared expertise in screenwriting. The next three days will be just as action-packed, promising lessons on a range of topics delivered by Kathryn Ma, Mac Barnett, Jory John, Jewels Smith, and other writing professionals. Everyone’s invited to hear the students read their work on Friday at 2:00 PM here at 826 Valencia.